Between 1945 and 1960 the Swiss watch industry experienced fifteen years of almost continuous growth. Annual production of watches and movements more than doubled, from 18.8 to 41 million units. Protective measures prohibiting the creation of new movement blank factories were extended in the early 1950s and later relaxed. But what probably saved the watch industry in the previous years of crisis came back to bite it. The makers of movement blanks who had remained independent had tremendous difficulty struggling against the power of Ebauches SA. One by one they faded out, and it marked the end of movement blank makers such as Angélus, Excelsior, Universal, Movado….. In the early 1960s Switzerland faced a new surge of foreign competition. In particular the watchmaking industry was being been resurrected in many of those countries where it had suffered severely during the Second World War. France and Germany now had a strong presence in the home market and the United States and Japan were entering the foreign markets with more and more success thanks to their large-scale companies such as Timex and Seiko producing inexpensive watches in their millions. Switzerland’s industrial fabric was still highly fragmented. There were over 3000 watchmaking companies, 80% of them employing fewer than 20 people. To reduce costs and to amalgamate companies into the size necessary to compete on equal terms with these foreign groups, ASUAG, with the help of the banks, set out again on a vast campaign of consolidation. 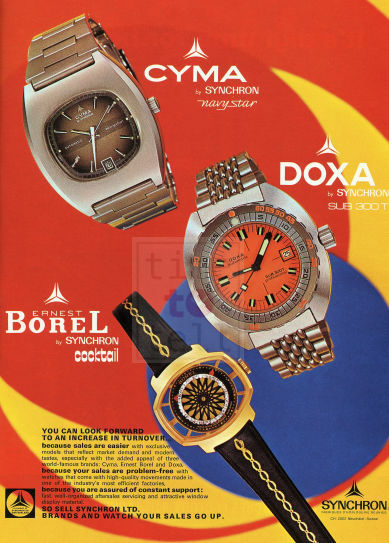 So in 1966 Chronos Holding was set up, taking over Cyma / Tavannes, entering into partnership with Gruen and creating the Synchron group in 1968, bringing together Ernest Borel, Doxa and Cyma. 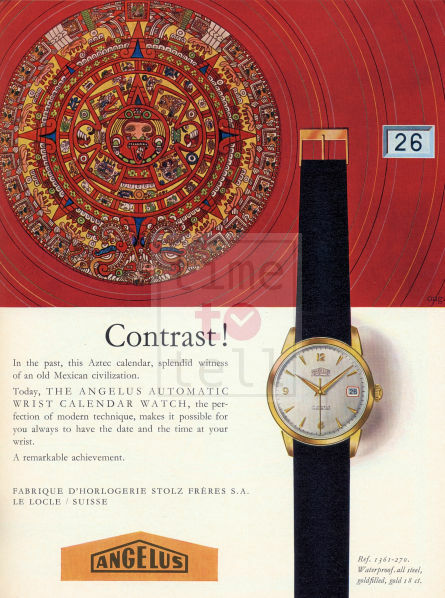 In 1971 ASUAG created the General Watch Co. bringing together the Certina, Edox, Eterna, Mido, Oris and Technos brands, and later that year buying out Longines, which owned Record and Rotary. The consolidation continued on the movement side. In 1967 Ebauches SA bought out Durowe in Germany and Sefea in Annemasse, France. Everything in the garden was rosy, production lines were running at full capacity and in 1974 Switzerland manufactured more than 84 million watches. But dark clouds were looming on the horizon. Very dark clouds. People usually say that the crisis that hit the Swiss watch industry in 1975 was the quartz movement. But the Swiss had developed the quartz movement quite early on. In 1974 a fair number of Swiss watches sold that year were quartz watches. What the Swiss watch industry had not expected was the sudden, brutal disaffection with the mechanical watch and especially the stunning drop in prices. The very nature of the industry had changed. The blinding speed of the development of electronics outpaced the much slower development of precision mechanical engineering. But quartz was not the only cause of trouble. The first oil crisis in 1973 led to global economic recession the following year, and just to make things worse the Swiss Franc was devalued and within a few years was worth only 70% of its 1974 value. Then things became really serious. From 1974, which was a record year, to 1983, the number of watches and movements manufactured in Switzerland fell from 84.4 million to 30.2 million, a drop of nearly 65%. Hundreds of companies disappeared, tens of thousands of jobs vanished. The ASUAG only had last ditch solutions. In 1978 ETA and A. Schild were merged, the Synchron group was dissolved, Borel, Doxa, Cyma were sold off. In 1980 the number of calibres produced by Ebauches SA was drastically reduced from 136 to 40. The following year ASUAG lost more than 44 million Swiss francs. In 1982 all the movement blank makers were merged under ETA. Oris was sold…… and losses exceeded 156 million Swiss francs. So here we are, dear reader, on the brink the abyss. At this point I need to introduce a new player in the game, another giant with feet of clay: the Société Suisse pour l’Industrie Horlogère or SSIH.